QR Codes brought about a cashless payment revolution in countries such as China and India. But this isn’t where the buck stops for this technology. Russia has a huge internet-connected tech-savvy population that is using QR Codes for many use cases. And QR Codes have made way onto Rubel currency notes too. Russia has added QR Codes to their latest currency notes. 200 and 2000 Rubil notes will now bear a QR Code. The National Mint Goznak and The Central Bank of Russia launched these notes earlier in October 2017. These QR Codes can be scanned using a smartphone equipped with a QR Code scanning app. The QR Code leads scanners to Central Bank’s official website. Here, people can read more about the QR Code feature and other changes in the new currency. The new QR Code currency will become part of general bill circulation by December 2017. This QR Code is expected to help people differ between original and fake currency and fight counterfeiting. Though already launched, the banks are giving businesses time to upgrade to accommodate this new technology. 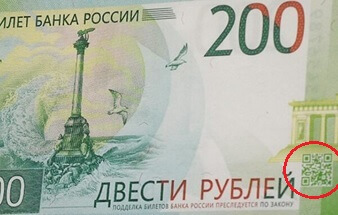 With time, it is expected that the new currency will replace the older 200 and 2,00 Rubil currency. Besides the addition of QR Codes, the new notes have changes in the color and layout. These changes, besides the QR Code, were selected through a public vote. Also see how QR Codes are now being used in anti-counterfeiting. What are your views on this Russian QR Code currency? Share your thoughts with us in the comments section below.